Effects: energising, antiseptic, warming, aphrodisiac, chases away insects. 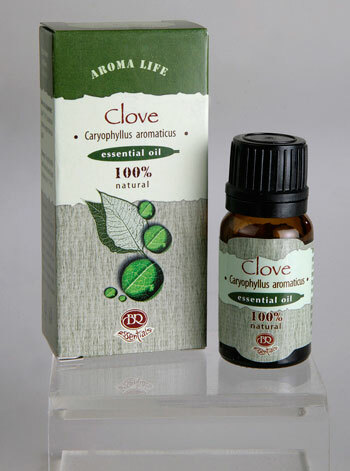 Benefits: The scent of clove essential oil is pungent, aromatic and spicy. In small doses it has stimulating properties, helps to overcome nervousness and mental fatigue; awakens and brightens the mind. Aphrodisiac. It strengthens the immune system; regulates the level of unsaturated fatty acids, the lack of which leads to body aging. Like most spices it also has antiseptic properties. Suitable as a flavor for oral care products. Strengthens the immune system. Helps against insomnia. Small amounts of this essential oil, added to massage blends will relieve muscles. Blends well with most of the citrus and floral aromas, lavender, lemongrass, sandal wood and clary sage. Attention: Contraindicated in hypertension and children!